One hallmark of a Smith education is the opportunity for students to take concepts they’ve learned in the classroom and apply them in the real world. For students interested in sustainability, these experiences can include Smith’s Campus as Classroom program, on- and off-campus internships, research with a professor, projects in conjunction with one of Smith’s academic centers and campus jobs. The Jill Ker Conway Innovation & Entrepreneurship Center helped turn my sustainable olive tree startup dream into a reality. When I visited my father in the Italian Sabina region, I noticed the prevalence of family olive oil cultivation. Frequently, these groves did not generate revenue, and an increasing number were being abandoned. In the United States, there’s a demand for organic non-GMO products and an interest in food education. I saw an opportunity and wrote a business plan in my microeconomics class for a sustainable olive oil company, Libellula, which means dragonfly in Italian. 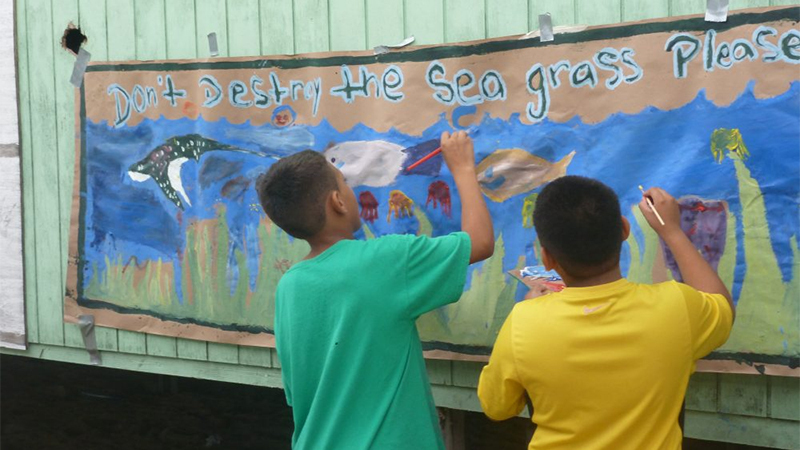 Coral Reef Ed-Ventures Program campers work on an educational banner about the importance of protecting sea grasses. Coral Reef Ed-Ventures is an innovative, cooperative educational venture between Smith College and the Hol Chan Marine Reserve in San Pedro, Ambergris Caye, Belize. This environmental education program began in 2000 to increase community awareness of reef system ecology and to encourage its conservation. Every summer since, an interdisciplinary team of Smith College undergraduate students develop and facilitate two environmental education camps for the island’s youth. Students participating in the Coral Reef Ed-Ventures program. In addition to leading the environmental education program, the Smith students carry out coral reef and mangrove research with Smith faculty and Hol Chan Marine Reserve staff while on Ambergris Caye. Past research projects have included studies on the health of both coral reefs and mangroves. 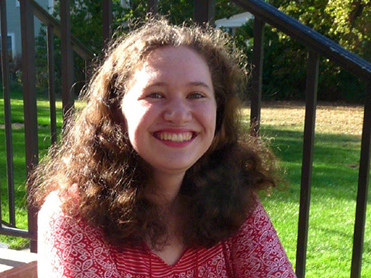 Read more about former Coral Ed-Ventures participant Sabrina Cordero ’19’s experience in an interview. 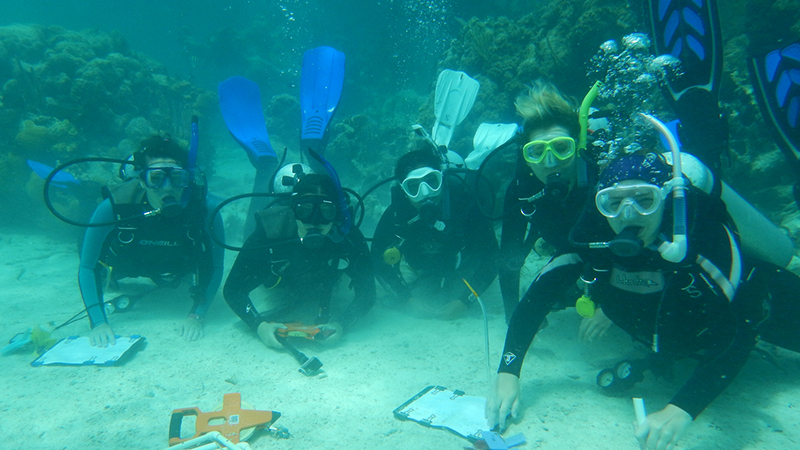 Each year the Coral Reef Ed-Ventures Program invites applications from Smith sophomores and juniors interested in participating in the eight-week summer marine environmental education and research program in San Pedro, Belize. This year the program will run from May 28-July 19, 2019. Interested in participating? Read the application information below for details on how to apply and to access the link to the online application. For more information, please contact Professor David Smith or Denise Lello. Coral Reef Ed-Ventures is sponsored by the Environmental Science and Policy Program. 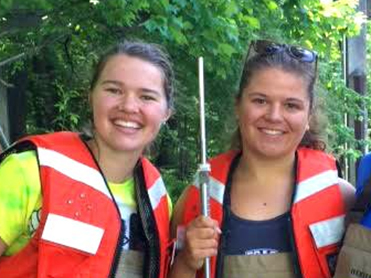 Smith’s Environmental Science and Policy Program and the National Oceanic and Atmospheric Administration (NOAA) have partnered to provide internships for Smith students since 1999. This program connects students with 10-week summer internships in conservation science, coastal ecology, resource policy and management, environmental education and science communication. Smith students have interned at numerous NOAA offices, labs and field sites across the country. Interns work side by side with NOAA scientists, policy makers and other staff to address current coastal and marine issues. Summer internships have a flexible start date. Fellowship stipends of $4,800 are provided by the Agnes Shedd Andreae 1932 Research Internship Fund. These fellowships are for Smith College students only. NOAA posts the list of internships in early January for the following summer. For more information about the NOAA College-Supported Internship Program visit the ES&P website, or contact Joanne Benkley, assistant director of the program. 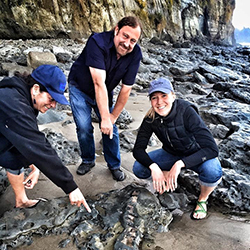 Photo above: Alexandra Golikov ’19 (on the right) looking at 24-million-year-old whale bones in rock in Capitola, California, during her NOAA internship. 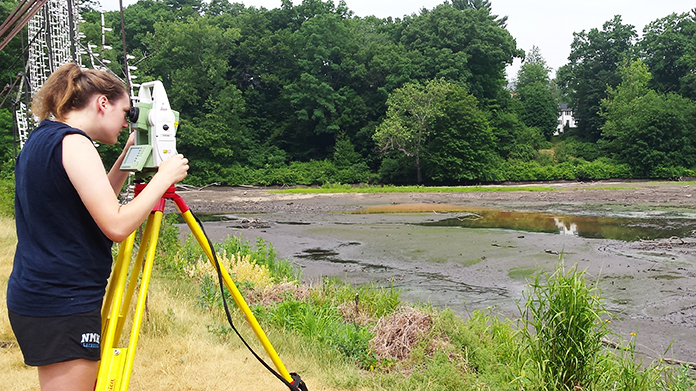 On- and off-campus internships are a great way for students to gain hands-on experience in sustainability. Faculty and staff help connect students with a wide of range of opportunities. As an intern with the campus sustainability office, I’m conducting research on carbon offsets for the Community Climate Fund. A carbon offset is a way to invest in renewable energy, clean technology and efficiency and receive a carbon credit toward achieving full carbon-neutrality. The goal of this fund is to help local businesses and nonprofits invest in a sustainable infrastructure, which saves them money, helps the environment and generates carbon offsets that Smith can use to reach its carbon-neutrality goal of 2030. Praxis stipends are designed to help students pursue opportunities that expand their education but which cannot or do not pay a summer salary. These internships help students build on their academic studies, make decisions about their careers and acquire the experiences and skills desired by employers and graduate schools. Environmentally minded students can work at part-time jobs on campus and elsewhere that help green our campus and world—and their wallets! Find opportunities through the Student Employment Office and The Lazarus Center for Career Development. 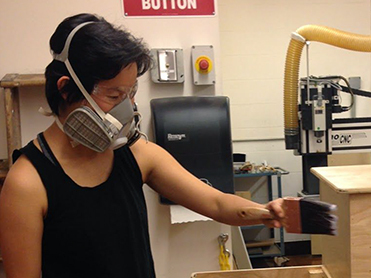 Smith students have numerous opportunities to participate in research projects related to sustainability, with faculty, staff, outside organizations and fellow students. Through Smith’s Student Research in Departments (STRIDE) Program, high-achieving students during their first two years are teamed up with Smith faculty as paid research assistants.